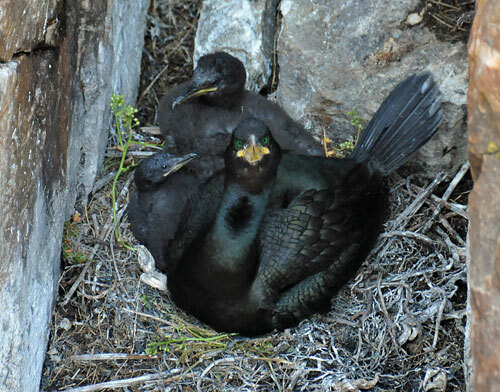 Some of you might remember the picture of the Shag with its eggs I posted a month ago. This one was much further, its young had already hatched and were with it in the nest. While the other one was at Sanaigmore this one was in the gorge next to Soldier's Rock on The Oa in the south of Islay. Keeping in mind this picture was taken in mid June they will presumably be gone about now (according to my RSPB Handbook of Scottish Birds ‘the young fly after 48 days, but continue to be fed by their parents for several more weeks before becoming independent.’). With that I wish you a great weekend, good night!